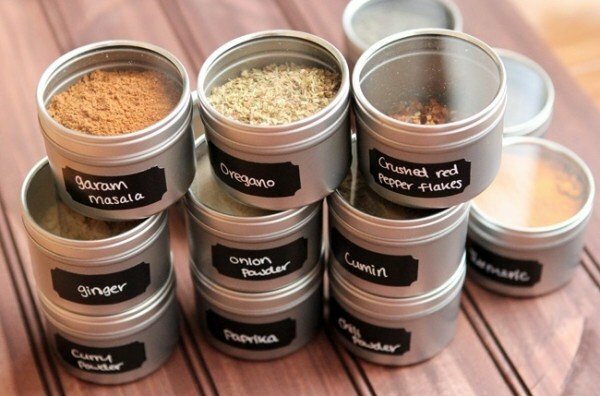 Everyone has spices in their kitchen and for many people it is the bane of your kitchen! The spice cabinet is overrun with containers, things have fallen over, for whatever reason you have four jars of cinnamon but you never use enough cinnamon to warrant having that many. We all understand this dilemma. We all dream of rows of beautifully organized jars of spices so that, like magic, what we need is at our fingertips with nary a thought! Dread opening your spice cabinet no longer! 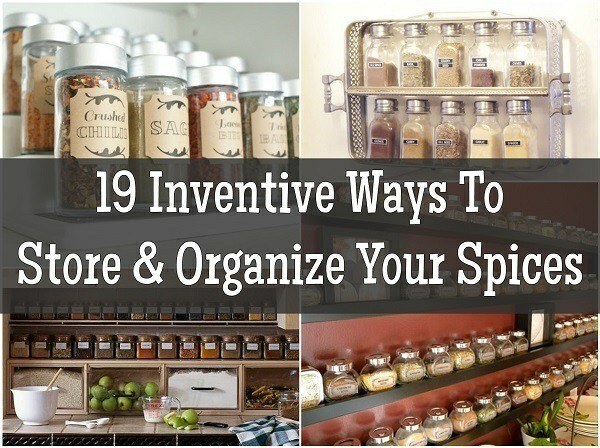 Here are 19 creative and simple DIYs to get those spices under control so that you never have to worry about them again. 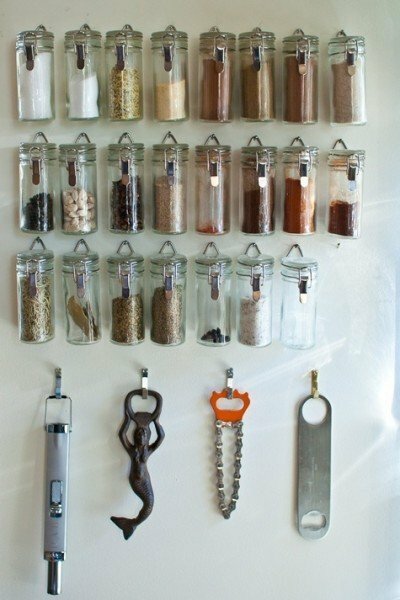 End of Cabinet Magnetic Spice Rack – Utilize the end of a cabinet for some great, out of the way but easily accessible spice storage! Just buy some metal sheeting and attach it to the cabinet. 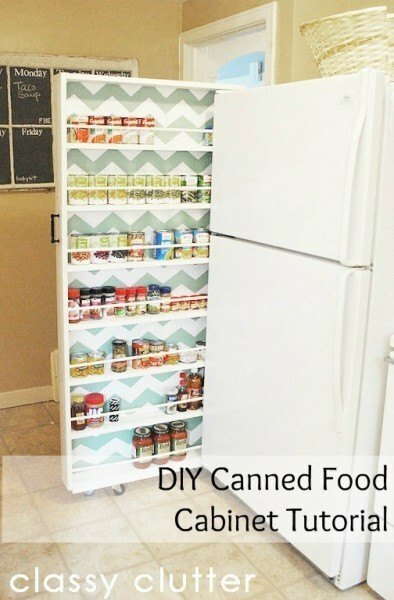 DIY Canned Food Cabinet – This great tutorial shows you how to make a sliding cabinet for cans and spices to utilize the wasted space around the fridge! 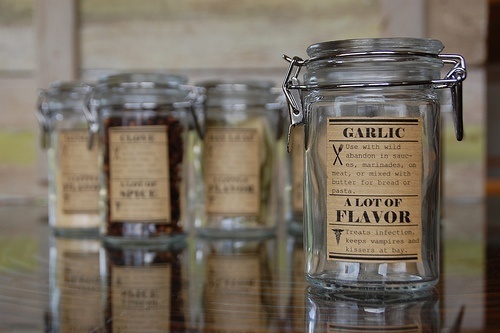 Dollar Store Jars – These simple glass jars are super cheap but, with labels, will help give your spices a uniform and organized look. 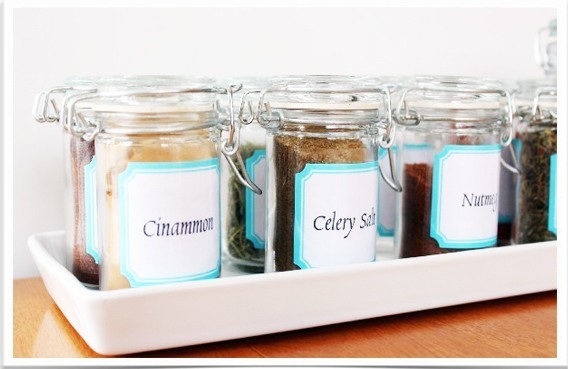 Glass Swing-Top Jars – Fancy, swing-top style jars make spices easily accessible and they will look great if you need to leave them out on the counter! 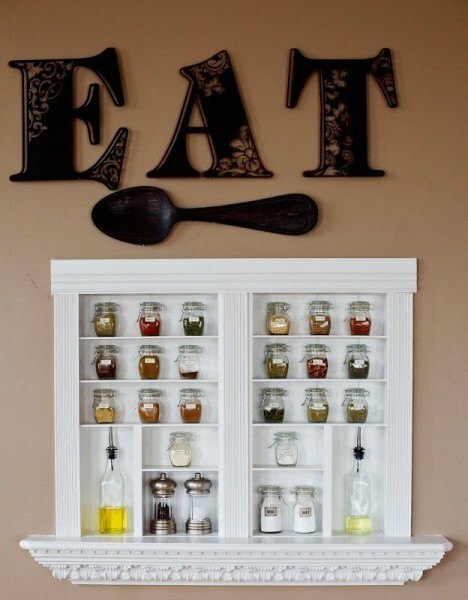 Hanging Jars – Hanging jars on the wall is a great way to store spices if you are low on cabinet space or just don’t want all the containers in the way. These look rather fancy too, all lined up in rows. 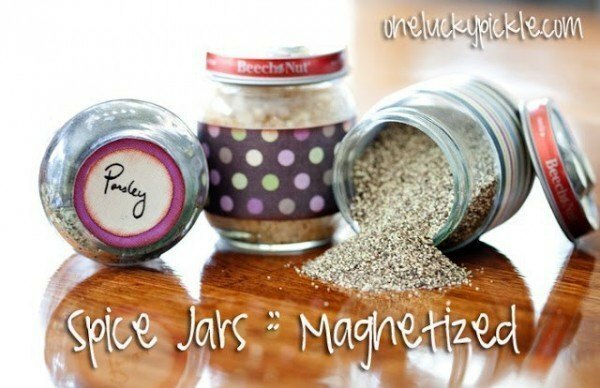 Magnetic Baby Food Jars – Repurpose baby food jars as small spice jars and magnetize the lids for a cheap and easy DIY magnetic spice jars! 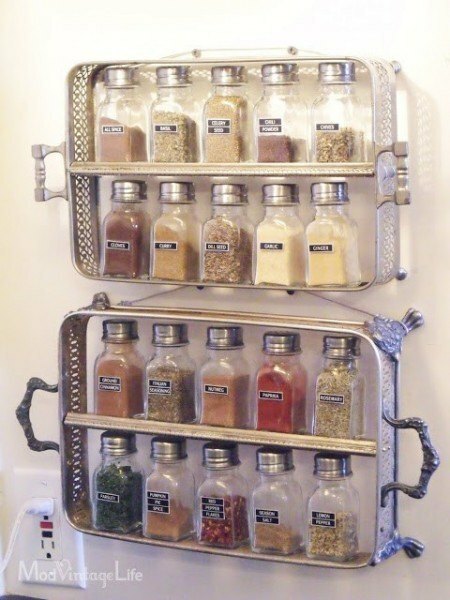 Magnetic Panel Spice Rack – Using the magnetic panel idea with some pretty jars creates a striking visual in the kitchen while also being completely functional. 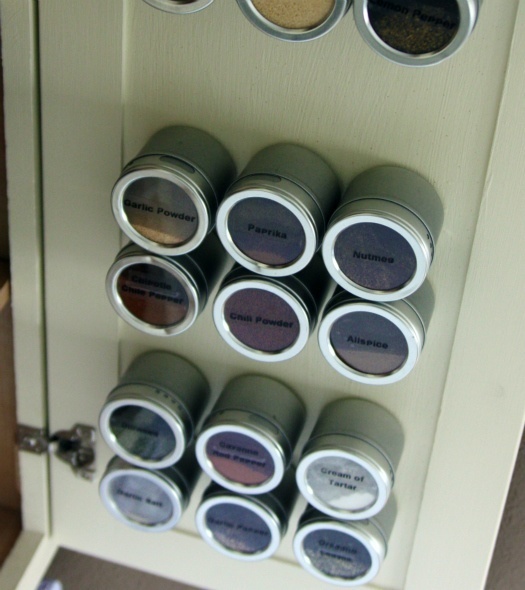 Magnetic Cabinet Door – Keep spices out of the way by using magnetic paint on the inside of cabinet doors and then sticking your magnetic jars to the inside of the door. 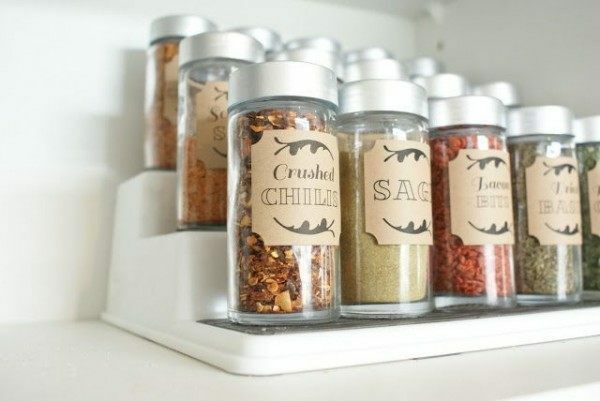 Mason Jar Spice Drawer – If you have a drawer deep enough, using wide mouth mason jars in a spice drawer can be a great way to keep your spices neat and orderly. 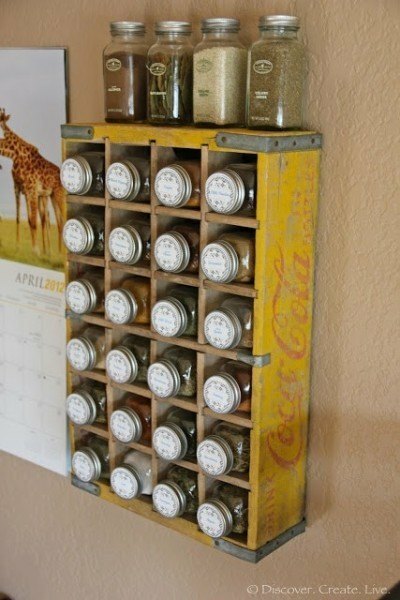 Reclaimed Palette Wood Rack – Follow these directions to make an easy wooden spice rack to use in the cupboard or on the counter to keep all of your spices visible and within reach. 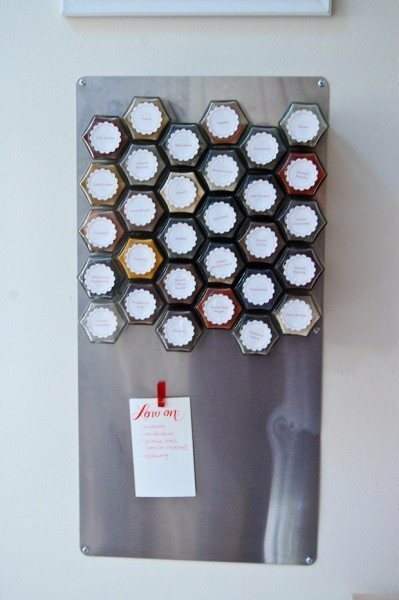 Repurposed Spice Trays – This tutorial uses a couple of antique silver trays and turns them into some simple and charming hanging spice racks! 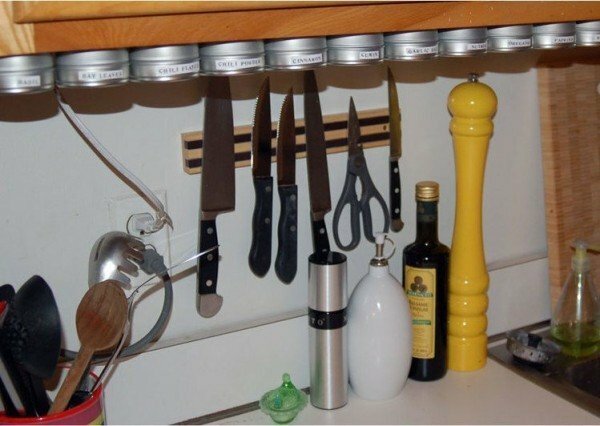 Under Cabinet Magnetic Spice Rack – The secret to these little jars are…metal rulers! 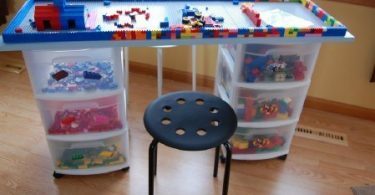 Just stick them up to the underside of the cabinet and stick your magnetic jars to them. Perfect! 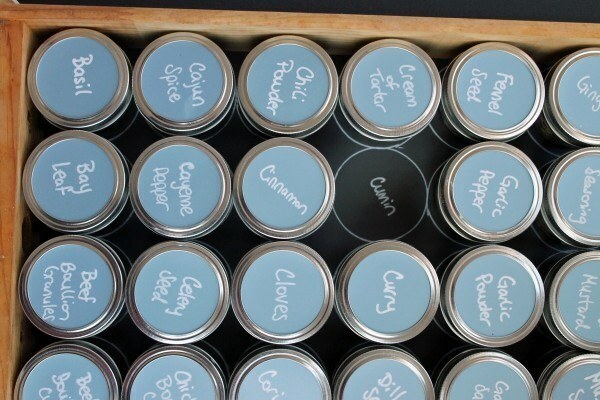 Silver Tin DIY Organization – This DIY shows you how to make your own chalkboard labels to keep spices looking neat and organized when they’re in your cabinet or on a shelf. 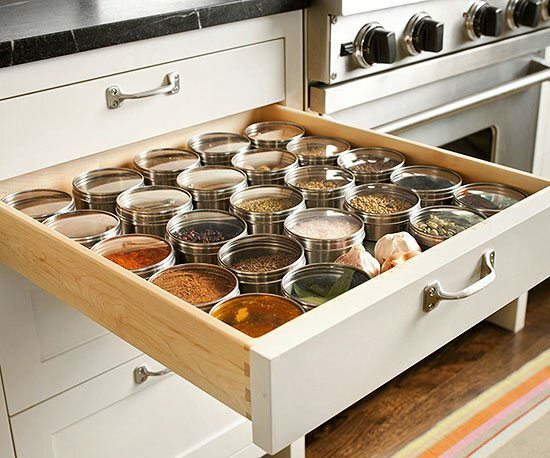 Spice Drawer – Here is another great idea for a spice drawer that looks organized and attractive! This allows you to see all your spice clearly. 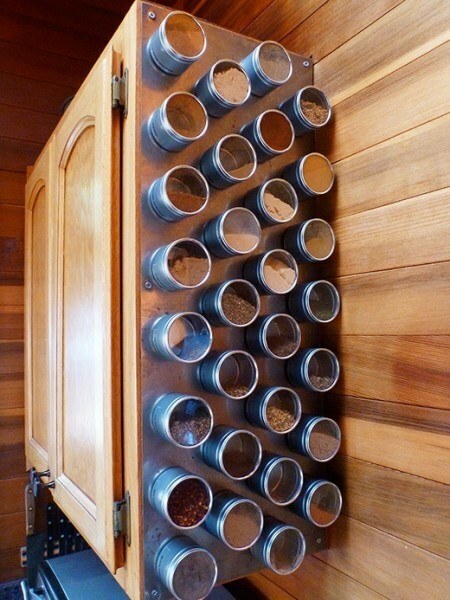 DIY Built-In Spice Cabinet – This one is a little bit more involved, but there is no denying that the final product to absolutely gorgeous! 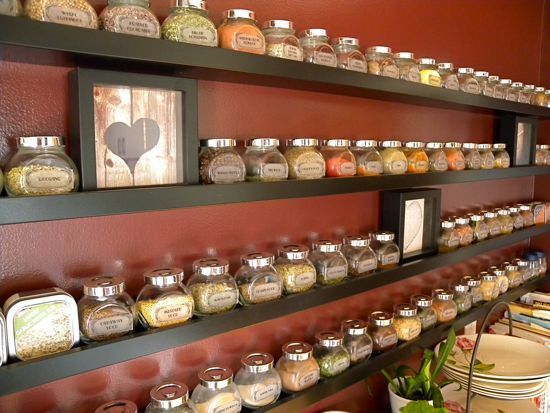 Spice Wall – Using IKEA jars and picture shelves you can easily create this stunning wall of spices to keep all of them out of the way but on display! 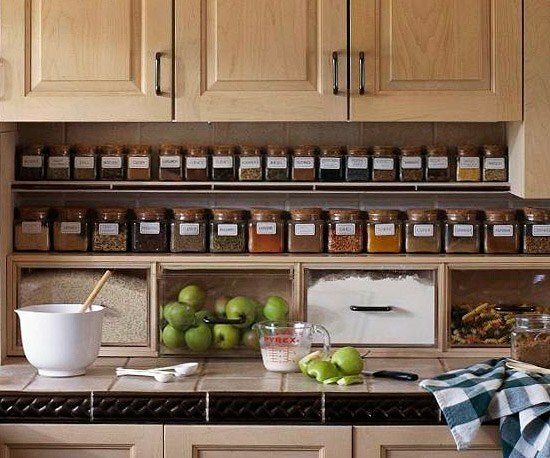 Under Cabinet Shelves – If you have the space for it, install narrow shelving under your cabinets to keep spices out of the way but easy to reach and see! 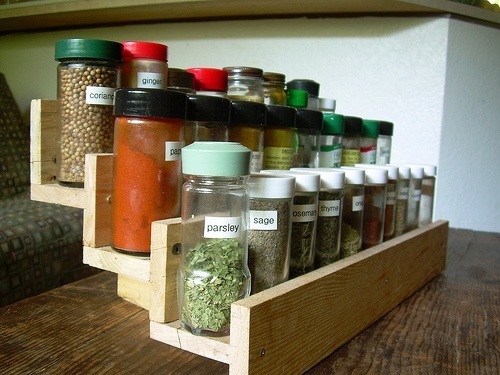 Vintage Rack – Using an old printing tray or, like this, a wooden shipping box is a great way to bring a little bit of vintage into your spice display. 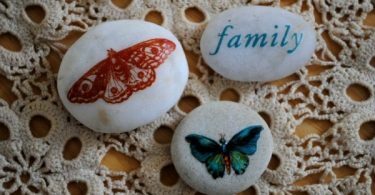 Spice Jar Labels – These spice labels are excellent! The best part, she offers both a downloadable PDF and the editable file if you want to create a few of your own spices!